Tag Archives: Let Freedom Ring! 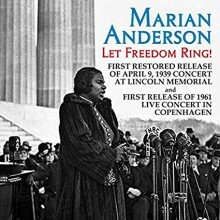 Marian Anderson – Let Freedom Ring! 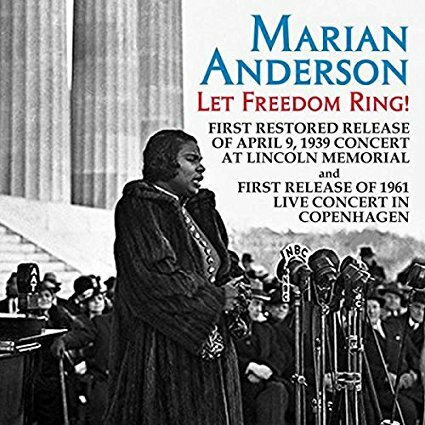 Though illustrious contralto Marian Anderson broke many barriers over the course of her career, her 1939 concert on the steps of the Lincoln Memorial in Washington, D.C. stands as a signal moment in the history of civil rights. Most know this story but it certainly bears repeating for a younger generation. After concertizing around the world in the 1930s and becoming the toast of Europe, Anderson’s agent, Sol Hurok, brought her back to America in 1935 for a historic homecoming at Town Hall in New York. His hope that her international stardom would shield her from racial discrimination in her homeland was unfortunately not realized. As was the case with all African Americans, concert artists included, Anderson was subjected to many indignities—not the least of which were segregated concert halls and denial of access to hotels and restaurants while touring. Though she initially avoided taking a political stance, this role was thrust upon her in 1939 when the Daughters of the American Revolution refused to rent Constitution Hall for Anderson’s proposed Easter Sunday concert. After being turned down by additional venues in the nation’s capital, First Lady Eleanor Roosevelt took up the cause (she had brought Anderson to the White House three years earlier), along with many other politicians and celebrities. To make a long story short, the Easter concert went forward on April 9, 1939, but was moved to the Lincoln Memorial on the Mall. Over 75,000 were in attendance, and the concert was broadcast live over NBC. Also included on this CD is a concert recorded over 20 years later at the Falkoner Centret in Copenhagen. Never before released, the October 27, 1961 performance includes Anderson’s typical mix of Brahms and Schubert lieder with a number of standard spirituals. Of particular interest are two lieder by Finish composer Yrjö Henrik Kilpinen, who died two years prior to this concert, as well as songs by Sibelius and an aria from Saint-Saens’ Samson et Dalila. As Haley notes, Anderson was 64 at the time of this concert and nearing the end of her career. Her performance is still captivating, even though a bit tenuous at times (Haley admits to making some pitch corrections). If you wish to learn more about Anderson’s historic 1939 performance, the booklet includes the riveting story as excerpted from Harlow Robinson’s The Last Impresario: The Life, Times and Legacy of Sol Hurok (New York: Viking Penguin, 1994). Marion Anderson’s personal papers are housed at the University of Pennsylvania.